Bryan Lee, 18, is a second-year violin student of Victor Danchenko at the Curtis Institute of Music. He began studying the violin at the age of seven at Temple Music Prep where he received the prestigious Starling Scholarship for many years. 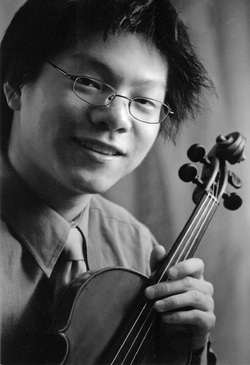 His previous teachers include: Choong-Jin Chang, Principal Violist of the Philadelphia Orchestra and Soovin Kim, a renowned concert violinist. Bryan has won numerous competitions including second at the 2004 Kingsville International Young Performers Competition and a Bronze Medal at the 2005 Stulberg International Strings Competition. He recently made his debut with the Philadelphia Orchestra as a winner of the 2005 Albert M. Greenfield Competition. Bryan has also performed as a soloist with orchestras in Delaware, New Jersey, Pennsylvania, and Michigan. He has attended summer programs such as Encore School for Strings, Silver Creek Chamber Music Workshop, and most recently Perlman Music Program where he studied with world-renowned violinist, Itzhak Perlman. In addition to his solo repertoire, Bryan is a member of the Curtis Symphony Orchestra and is also an avid chamber music player.